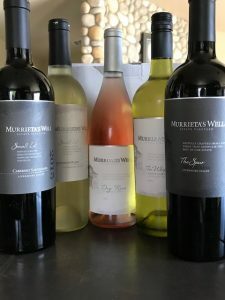 Murrieta's Well Wins Again - Write for Wine: It's Wine O'Clock Somewhere!Write for Wine: It's Wine O'Clock Somewhere! This Sauvignon Blanc is a sharp contrast to the New Zealand wines that are prevalent in the market these days. This Livermore Valley wine has more body, and features floral and tropical fruit notes instead of zesty lemon. It was fermented and aged in neutral French oak barrels, rather than in stainless steel tanks with native fermentation. So if you prefer a rounded, prettier Sauvignon Blanc made in the French style, this wine is for you. While it does have some minerality and citrus aromas, the flavors feature tropical fruit, honeysuckle and white peach. This wine can be enjoyed through 2022; it is food friendly, but also can be enjoyed by itself, poolside, lakeside, or on the deck. This is the fourth vintage of The Whip that we have tasted and recommended to friends who like crisp whites with a touch of sweetness. The Whip blends 33% Sauvignon Blanc for natural acidity with rich and full 24% Semillon and 21% Chardonnay, and with 12% Orange Muscat and 10% Viognier to provide fruit and floral expressions. These different varietals combine into a layered, lively and textured wine with a crisp finish. The Whip is summer in a bottle — a food-friendly wine to pair with summer salads, sushi, grilled salmon or spicy foods. Or you could sip this white blend on its own on the deck. Enjoy through 2021. What a lovely rosé — you just might want to drink it on the deck or by the lake all summer long. Somehow this dry wine is both subtle and luscious at the same time. The nose has whiffs of creamy strawberries and melon, leading to flavors of watermelon, strawberries and juicy red fruit, with a hint of mint and minerality on the finish. A blend of 42% Grenache, 39% Counoise and 19% Mourvedre, this wine will pair well with grilled salmon, lobster ravioli, charcuterie or any light, warm-weather dish. Enjoy through 2019. Bring out the barbecue! Delicious, juicy, smooth, versatile, well-crafted, complex and balanced, this big red wine blends 48% Cabernet Sauvignon, 20% Petite Sirah,18% Merlot, 8% Petit Verdot, and 6% Cabernet Franc. In other words, the Cab Sauv forms a beautiful foundation for the other varietals. A delightful and powerful array of aromas — dark fruit, baking spices, clove, vanilla, coffee and cocoa — represents the numerous varietals in this intense blend; they are followed by notes of black cherry, blackberry, chocolate and spice. In addition to BBQ, The Spur will pair well with roasted meats, dishes with red sauces, mushroom dishes, or rich blue cheese. Enjoy through 2023. This is a full-bodied Cabernet Sauvignon that calls for a steak, short ribs or lamb. The Cab Sauv (87%) is rounded off with 11% Petit Verdot and 2% Malbec, featuring aromas and textured flavors of red and black fruits (particularly plums), black olive and chocolate. Yes, this wine is fruit-forward, but the fruit is not overpowering. As one of my tasting colleagues aptly said, “This is the wine where the masses can meet the geeks.” Of note, the release date for this Cab isn’t for a couple of months (September); it can be enjoyed through 2025. This entry was posted in Cabernet Franc, Cabernet Sauvignon, California, Chardonnay, Counoise, Grenache, Malbec, Merlot, Mourvedre, Petit Verdot, Petite Sirah, Sauvignon Blanc, Sémillon, Viognier, Wine and tagged Cabernet Franc, Cabernet Sauvignon, California wine, Chardonnay, Counoise, Grenache, Livermore Valley, Malbec, Merlot, Mourvedre, Murrieta's Well, Muscat, Petit Verdot, Petite Sirah, Sauvignon Blanc, Semillon, Viognier by Margot. Bookmark the permalink.